My first 6 months of 2015 are sorted in terms of challenges because I like to have things to aim for in terms of my fitness (plus I want to add to my growing medal collection…). I entered the London Triathlon 2 years ago as a challenge to myself to get fit and while I had a brilliant experience on the day it didn’t really kickstart me into getting fit. 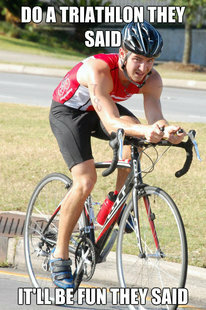 However, now that I’m much fitter I’ve decided to work towards the Olympic distance one and challenge myself further. Watch this space for training updates!